Manchester United kept their fine form going along as they beat Stoke City 2-1. 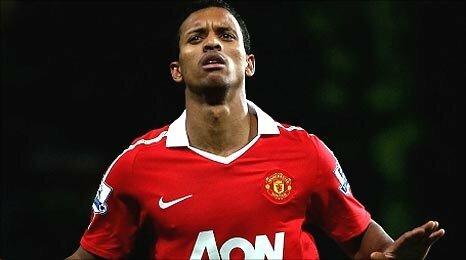 Hernandez and Nani were the real stars of the play at Old Trafford , who put up an extraordinary show and made sure United stays on top. By this , it makes United going unbeaten 20 games on the trot, making the second longest go without defeat in single Premier League after the Arsenal in 2003-04. Berbatov started off with his fine touch once again, as he went on the to provide Manchester United with their first chance but it went wide. Later in the game Javier Hernandez successfully converted the ball into goal on Nani's pass in the 28th minute.With 1-0 lead ,United were in a commanding position, until Stoke started off a fine second half proceedings where after five minutes as Whitehead totally took the charge and made the equiliser for Stoke. But within a gap was filled in just minutes later as Nani sprung in and did his trick by wonderful left foot shot homing United to be un-beatable lead for United.Stoke tried hard to fight back for a second time, but it was United who looked more likely to add to the scoring as the game wore on. With high amount of dominance in possession Stoke allowed United the ball , as they kept bullying the Stoke all the 90 minutes. Now almost well 3 points ahead of Manchester City , with played lesser games than them and five away from Wenger's team who have played same number of games.Ferguson boys will be expected to show up a great show in the other upcoming matches as the season goes on, and will makke a real chance making the toppers at the end of the season.